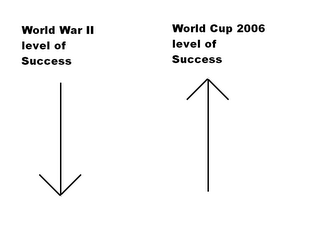 I'm thinking Italy should be in the "lost twice" column, too. After being beaten by the allies, surrendering, and switching sides, the Germans occupied the northern part of the country, disarmed the government, and instituted the Italian Social Republic under Mussolini. The Italian Social Republic was then beaten. Again. Actually, if you count the German reaction to Italy's initial surrender as a defeat for the new pro-ally Italian government, and it's replacement by the ISR, Italy lost three times. Twice to the allies and once to the Germans. That has to be some sort of record for a single war. So what you're saying is that you would judge Italy to be the bigger loser of DoubleYa-DoubleYa-Two, and therefore the worthy heir of the 2006 World Cup title? Wow, even when I'm wrong I'm right.